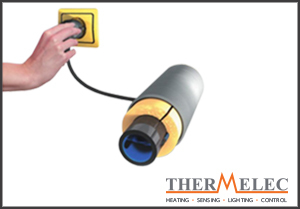 These self-regulating heaters are approved for use in both hazardous and non-hazardous areas, where the characteristics of this product not only improve safety but also reliability too. 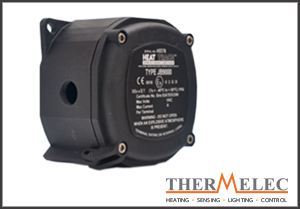 Even when overlapped these heaters will not overheat and the power output self-regulates in response to the pipe’s temperature. It’s quick and easy installation mean the self-regulating heaters won’t need hours of labour, specialist equipment, skills or tools. Constant wattage heaters are widely used on a variety of applications such as freeze protection for pipework and vessels and also the maintenance of process temperature. 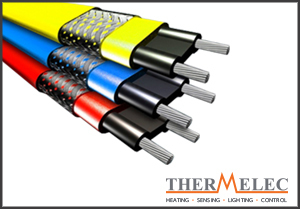 These heaters can be produced with a braid and outer jacket, however a braid can also be supplied on its own. The heaters can be produced within 12 to 1000V and up to 425°C (797°F) withstand temperature. It is quick and easy to install. Here at Thermelec we offer a range of winter protection kits to help you through those cold winter months and freezing temperatures. For pipe protection we can offer a single solution pipe protection winter kit, which is a simple, low cost solution that uses self-regulating heating tape that is able to maintain the required pipe temperature during the cold winter months. We can also supply Gutter freeze protection kits which also use self-regulating characteristics, here the heating cables allow the adjustment of its heat output in accordance with its temperature. The cables are positioned along the gutters and drainpipes that allow the water to flow freely. 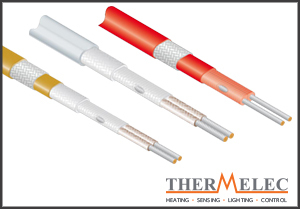 Here at Thermelec we can also supply you with a variety of termination systems precisely designed and approved for use with all trace heating cables. These include standard gland and junction boxes for use with conventional metal or plastic cable glands. The StripFree universal connection system provides the installer with a fast and simple method of power, in-line and T-splice connection for self-regulating heating cables. The DESTU system reduces the risk of damage to the heating cable as it emerges from the thermal insulation for connection into the junction box.